GoGo Quinoa Red & White Quinoa Macaroni offers a healthier and gluten free take on the classic macaroni noodle that is also wheat-free and vegan! Quinoa functions as a substitute for almost any grain including white rice or couscous, but is so flexible that it can also function as a pasta substitute. Because of quinoa’s versatility, you’ll see various quinoa recipes that take advantage of this super food! Ingredients: Organic white rice flour, organic white quinoa flour and organic red quinoa flour. May contain nuts or traces of nuts. Cooking instructions: Bring 3-4 liters of water to a boil. Add salt if desired. When the water is boiling well, add the pasta and stir often during the first 2 minutes. Cook additional 5 minutes stirring occasionally (for al dente texture); or between 7 to 9 minutes total for regular texture. Drain and rinse promptly with cold water. Serve immediately with your favorite sauce and condiments. My favourite GF pasta brand. It's the best - the taste can't compete. My pet peeve is when GF pasta has that 'corn' taste. This does not have that and it tastes healthy and you feel great after eating it. Great gluten free pasta. Excellent texture and flavour. I would like to mention: THIS IS THE ONLY GLUTEN FREE PASTA THAT CAN MAKE A "COLD" PASTA SALAD without the noodles getting hard after refrigeration or the next day. Price is hard though! Tastes great, doesn't get soggy, and protein and mineral-rich pasta is always a bonus especially for kids. This is the best gluten free pasta I have tried! If you follow the directions on the bag they turn out perfectly every time! Wonderful product. The noodles don't get slimy or soggy like some other gluten free noodles. Great product, great tasting! Would buy again! Great product! Cooks and tastes like traditional pasta. Very similar to actual pasta with added benefits. Awesome. Delicious, kids gobbled it up too. But why such a small bag? Pros: Taste great and the texture is basically the same as regular pasta. It's lighter and not as sticky as straight rice pasta. I wish it came in a bigger bag! We love this pasta, a total hit in our house with adults and kids alike! Wish it was a bigger package and a lower price point. Love the Quinoa Noodles. It really doesn't affect my digestive system. Love the sale price. Wish you could alert as to the sales on the items I buy. First off, well.ca is amazing! Products were received quickly and I love the personal touch they give on their receipts, thanks! This pasta is wonderful in texture and flavour, holds shape as well. Was surprised at how small the package was though. One package just enough for one meal for family of four. Loved this product! Made a butternut squash sauce on top! I love this product! I've been cooking with it, in single portions, and love that bit cooks in a few minutes....easy to make as a hot meal or cold salad! Also enjoying the low fat, high protein benefits! Best pasta product on the market because it does not have corn. Much better tasting than rice pasta. Great tasting!! Just wish you got more for your money! This is my go-to gluten/corn-free pasta. Good taste, good texture. I get 3-4 servings from a bag. Good taste. Have to be careful not to overcook. The bag was super small one enough for two people max. Great taste and texture but was surprised by how small the bag was and how it was like rice pasta where there water gets super starchy (hence the instructions to rinse with cold water after cooking), that and the nutritional profile wasn't great - not better than plain white pasta really - so, maybe a good option for those who are gluten free, but not as a "healthier" option for the fam for the price. Great taste. Whole family loved it. Only complaint is size of the bag for the price. I really enjoy the GoGo Quinoa pastas, and order the macaroni frequently. I've cut the cooking time quite a bit, though. I find that 8-9 minutes is long enough. Very happy with product. Texture and taste are great. Excellent, gluten-free choice, esp. when rice is not a great option. Delicious!! A nice break from brown rice pasta. Cooked faster than package directions. Kids approved!! Tastes great and helps avoiding eating too much rice when switching from regular pasta. 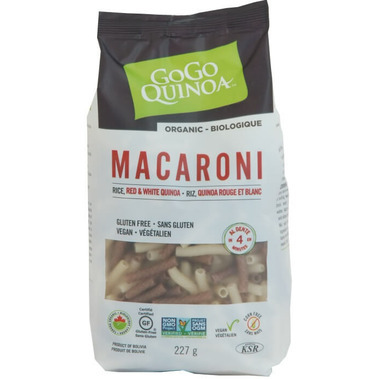 GoGo Quinoa are my favourite gluten-free pasta - delicious! We found that it lacked flavour, but the kids loved the texture. Very good product! My daughter loves it. Loved this product - really expands so you need only 1/4 of the box for a single serving. I use it to make Mac and cheese and was totally satisfied with the texture and taste. Have already recommended it to several friends. Very tasty! I cannot get in this product where I live, so its great to be able to order it online. My husband and I love this product. We prefer its texture to that of rice pasta. 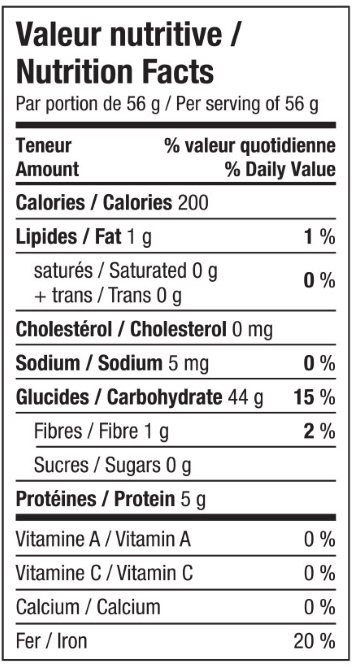 Just keep an eye on it while cooking, as it might need to be cooked a little less than what's indicated on the package. It is true that it is a small box, but since we've cut down on eating pasta, I simply order a few boxes at a time, with other staples, and it suits our needs. After tasting rice and kamut pasta, this is our favorite gluten-free pasta by far. The pasta tasted great, but it did get a little sticky really quickly, and there was not enough of it to feed my hungry family. Love this product ... not pasty or nasty like other gluten free rice pastas ... love my Quinoa and one of the most nutritious food on earth !!! My daughter (16mo) loves this macaroni and even my husband will eat it with homemade sauce. Excellent taste - far better than rice pasta. A little pricey so I wish there was a bit more in the box. Very excited at this find. Am trying to observe a more gluten free diet and can't wait to try this one!! !